Usually Sunday starts with the thought of making something good for lunch. I guess, it is the same in any household. Amma would always want to make Sunday very special to us being the only day our family had lunch together. Therefore growing up, I developed the habit of having a nice sumptuous meal on any Sunday. The thought of making Sambhar, Poriyal or kootu will never occur to me. Like any other Sunday, with no particular recipe in mind I decided to experiment with the ingredients I had at home and made a chicken curry with fresh cilantro, spices and some cashew to balance the flavor. Most often these self made recipes turn out to be a big hit~ like movies with no big starcast turn out to be great hits. Cut and clean the chicken and marinate with chilli powder, turmeric powder, salt, yogurt/curd. Heat oil in a kadai/ pan and add ground masala, fry until the raw smell goes and the oil separates. Simmer for a good ten minutes. To the masala, add the chicken and mix well for about five minutes. Close and cook until the chicken is well cooked. Uncover and simmer for about ten minutes stirring occasionally. Serve with Rice, Chappati or Paratha. Tips: I always use the chicken with bones for any chicken gravy. 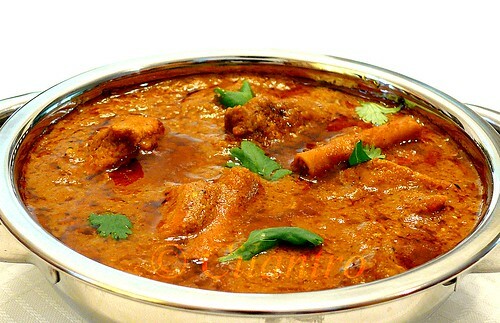 I use the boneless for chicken tikka masala and other chinese dishes. Simmering for five to ten minutes separates the oil from the gravy. Wow the chicken dish looks so so yummy delicious. I love the texture of the gravy. yummy chicken. gravy looks delicious. Looks great, it would be a great gravy for vegetarians minus the chicken I would think. I love the taste of cilantro, so this recipe sounds like a winner to me. Same here, sumptuous lunch with a movie is what I remember from childhood. the movie was nothing to write home about (usually the regional movie on Doordarshan) but the lunch was something else altogether. The dish you have here looks delicious. I will give this try very soon. This is a very cool chicken recipe. Love this a lot. So mouthwatering. Will try is soon. YUM! You can try with vegies too... I made it with paneer for potluck and turned out well. Thanks for Cilantro Chicken recepie in your blog. I tried and it came out very well. Love this recipe. I've linked back to it from http://our-cherished-world.blogspot.com/2010/10/coriander-prawns.html. I've used prawns and chicken in different versions. Both taste great. Thank you Swetha for the feedback. I am glad you tried. I will also try making it with Shrimp.